In an article in its website, HGTV comments on colors that it considers to be among the best ones to choose when selecting paint for your kitchen. In this article we will take a brief look at how some of the colors mentioned in that article are being used in kitchens. Additionally, we will highlight some natural stone colors that might be great ones to pair with some of the kitchens we will consider. The green kitchen shown above makes great use of green and shades of brown and white colored tile shown in the photo. 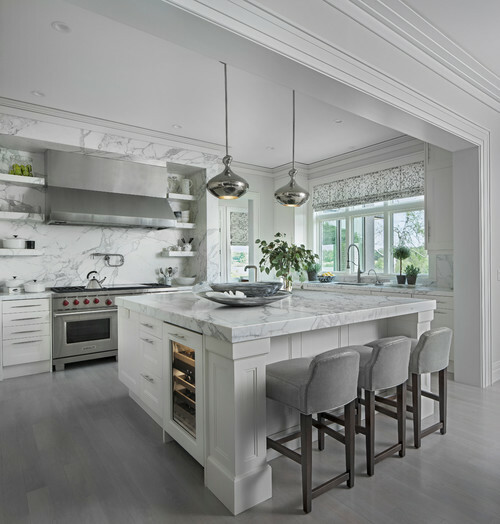 And even though the designer chose to use an open style, wooden island, natural stone could have been just as easily selected as a countertop material for that island. The Baltic Brown granite above is just one example of stone from our gallery of granites that could be used to compliment the green color selection featured in the kitchen above. In fact though, a variety of granites, marble, or other stone types could be used in this kitchen. The light gray and white kitchen below makes use of stone countertops that coordinate with the paint and cabinetry in this kitchen. 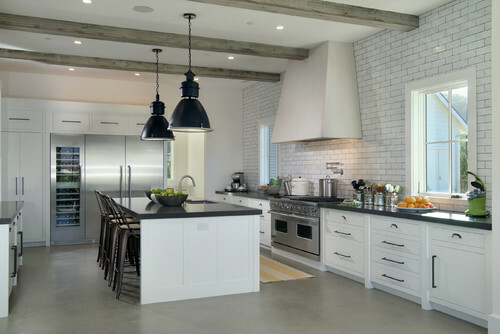 The last kitchen we will take a brief look at uses rustic wood for beams in combination with Black and White. Additionally, the countertop in the kitchen below appears to be stone textured with a leather finish. Black natural stone can be found in an array of stone types. This countertop could be textured and fits very nicely with the natural wooden beams and the neutral flooring. Granite and other natural stones can be finished using stone tools and texturing brushes and/or abrasives to produce the desired leather textured effect.